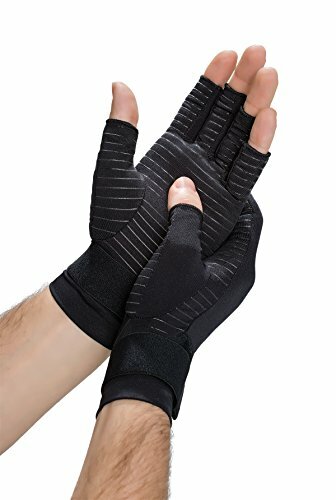 Copper Fit Hand Relief Compression Gloves | What Should I Say? Copper Fit Hand Relief Compression Gloves by Copper Fit at What Should I Say?. Hurry! Limited time offer. Offer valid only while supplies last. Don't let pain and stiffness stop you cold! From your trusted friends at Copper Fit, come our new Copper Fit copper infused compression gloves. Don't let pain and stiffness stop you cold! From your trusted friends at Copper Fit, come our new Copper Fit copper infused compression gloves. Designed to support muscles and joints and help relieve stiffness and soreness in your wrist, palms and fingers! Form fitting like a second layer of skin, adjustable compression and an open finger design for open feel and control. Have hand and finger numbness? Does your desk job make you sore and your fingers have numbness and tightness from all day computer work and typing? Try Copper Fit Compression Gloves! Suitable for Men and Women of all Ages. Each package contains one pair of Copper Fit copper infused compression gloves: one for each hand. Hand Relief compression can be used for all day relief from arthritis pain, joint swelling and carpal tunnel. The pair is adjustable but meant to fit tightly - like a second skin. Please refer to size chart for best fit. How to Measure: With your hand open, measure across the palm of your hand below your fingers. Size S/M fits a palm 2 3/4" - 3 1/2" across --- Size L/XL fits a palm 3 3/4" - 4 1/2" across. If you have any questions about this product by Copper Fit, contact us by completing and submitting the form below. If you are looking for a specif part number, please include it with your message.